While virtual reality is still somewhat of a novelty, it hasn’t stopped companies like FiresVR from making new VR hardware. 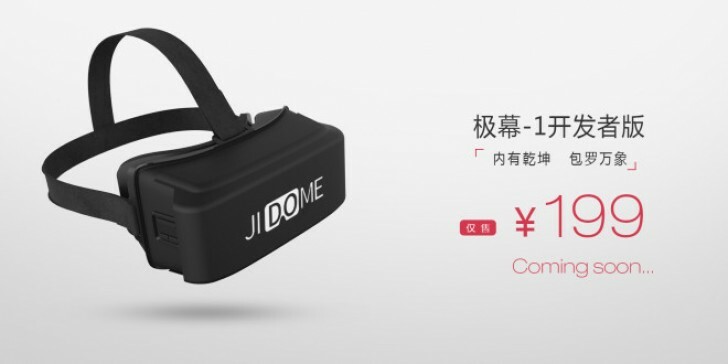 The headset is going to be called the JiDome-1 and is among the first VR products directly comparable to Samsung's Gear VR. The company calls itself “the Xiaomi of China’s VR industry”. While other products like the Samsung Gear VR, Holo Lens, or the Oculus Rift are manufactured in China, they don’t have many “official” Google Cardboard-type of VR accessories. This is the first company making a real VR product for China. The headset was demonstrated with a Xiaomi Note flagship phone but the company still has to work on compatibility with more phones on the market. Due to hardware and software limitations with the technology used, as of right now, the JiDome-1 is only compatible with 30% of the phones on the market. The JiDome-1 is said to be available to developers in the first quarter of 2016. It uses an optical structure that is able to adapt to different screen sizes. The headset features a 9-axis gyroscope and proximity sensor, cooling fans, and will hold a price tag for developers who wish to purchase it of ¥199 which converts to around 30 dollars.